Buttons, Touchscreens, And Other Dangerous Technologies : 13.7: Cosmos And Culture The most successful technologies are so seductive, user-friendly, and so apparently innocuous that we hardly notice them entering our lives, says Jimena Canales. One such technology? The pushbutton. Jimena Canales is a faculty member of the Graduate College at University of Illinois, Urbana-Champaign and a research affiliate at MIT. She focuses on 19th and 20th century history of the physical sciences and science in the modern world. Her most recent book is titled The Physicist and the Philosopher: Einstein, Bergson and the Debate That Changed Our Understanding of Time. You can learn more about her here. "The future is already here — it's just not evenly distributed," is an often-quoted line from the brilliant science-fiction writer William Gibson. Gibson's phrase is usually read as a commentary about the uneven access to technology and unequal distribution of resources in the modern world. But it rings true in another sense too: The future creeps into our lives without us noticing it. Luddites and technophobes fight against technological innovations so threatening and so obvious that they can be resisted. But the most successful technologies are often those which evade any and all sources of opposition by being barely noticeable. These are technologies that are so seductive, so user friendly, and so apparently innocuous that we scarcely notice them coming into our lives. The pushbutton was one such technology. The term "button" was first defined in the 14th century as a "bud, pimple, any small projection." Prof. Rachel Plotnick at University of North Carolina has studied the time when these apparently simple devices were so innovative that researchers rushed to patent and commercialize some of the first prototypes. "Hundreds of patent applications were filed for 'electric buttons' or 'push-buttons' between the 1880s and 1920s," she writes, "reflecting the fact that these quite common interfaces often served as sites for creativity, innovation, and iterative design." Resistance to these little objects was not completely inexistent, and a few keen observers considered them worthy of attention, but they mostly passed undetected right in front of the Cerberus-like forces guarding the entrance to the future. Almost a decade ago, it seemed that buttons and traditional keyboards were likely to disappear, to be completely replaced by touchscreens and trackpads. In 2007, Steve Jobs introduced "the pinch" for zooming in and out of images, awing eager tech consumers. A few years later, aficionados started hearing rumors about Apple's and Microsoft's latest innovations that pointed towards the possible extinction of the button. "While it may be hard to imagine right now, eventually there will not be physical keyboards," wrote the author of Touching: All Rumors Point To The End Of Keys/Buttons in (2009). 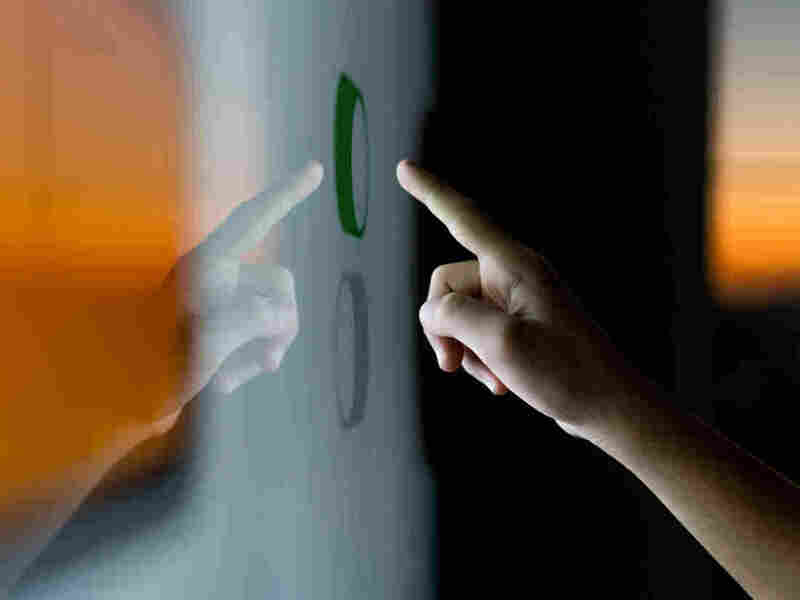 Today, pushbuttons face stiff competition from lookalike "touch icons" in screens that can be touched or clicked on with a mouse. Swiping and scrolling have made even these doppelgangers completely unnecessary. Yet most of us are still surrounded by hundreds of these little physical or virtual buttons that we command from the tip of our fingers, and which we use all the time, turning devices on and off, tapping into our computer or smartphone keyboards, and so on. What we can or cannot do with our buttons reveals an uneven distribution of power and agency across society. The excitement around the possible extinction of buttons and the development of entirely new human-machine interfaces can be compared to how users felt around the time of their introduction, when pressing these little monsters started supplanting the use of switches, dials, levers and cranks. The playwright Arthur Miller recalled the halcyon days of his nearly button-free childhood: "Except for light switches nothing worked by pushing a button. The phonograph had to be wound, a lot of the cars had to be cranked, coffee was ground by cranking, too, and the hand still had uses beyond separating pieces of paper money and pointing." Similarly, the writer Walter Benjamin, reminiscing about his Berlin childhood in the decades around 1900, fondly recalled his father's struggles cranking the telephone to get the call through. "His real orgies were reserved for cranking the handle, to which he gave himself up for minutes at a time, nearly forgetting himself in the process. His hand on these occasions was a dervish overcome by frenzy." It was then that the "employee at the other end was in danger of a stroke, as punishment for her negligence." Then, like today, not everyone had access to buttons and only a few had access to buttons that could produce great effects from small actions. Presidential button-pressing displays of power were common during the turn of the century. President Grover Cleveland showed off his presidential authority by pressing a "golden button" at Buzzard's Bay and setting in motion — 1,000 miles away — complex arrangement of wheels of machinery, blazing cannons and thousands of fluttering flags at the Cotton State's great industrial exposition (1895). His successor, President William McKinley joined other presidents of the Western Hemisphere during the Pan-American Fair (1901) to set off great fountain pumps in faraway South America. And earlier this year, newspapers worldwide covered President Donald Trump bragging about the size of his button. His now famous Jan. 3 tweet claimed: "I too have a Nuclear Button, but it is a much bigger & more powerful one than his, and my Button works!" Security experts quickly weighed in on his comment, agreeing that no such button even exists. The history of the button reveals some of the most perplexing paradoxes of our times. In theory, it can seem as a "democratizing" technology — almost anyone has the ability to press a button. But the effects of this nearly effortless gesture are profoundly unequal. Since it ostensibly separates an action from the person performing the action, it may help us evade responsibility. It therefore becomes incumbent upon us to develop a more comprehensive notion of agency and social responsibility, one that takes these technologies and their effects into account. By design, and by their mere existence, buttons presuppose certain actions, bringing into existence a future that is already here.